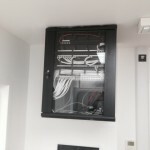 HR Cabling has just completed a prestige commission for a large catholic school in Woking. The job consisted of installing Cat 6 data cabling throughout the building to upgrade the digitial capacity of the school phone systems. This will greatly enhance the usability of both admin and classroom features. We completed the task on-time and on-budget.